A young Englishman named Philip plots revenge against his cousin's wife Rachel shortly after his cousin becomes ill and passes away. The reason Philip blames her is because of a mysterious letter he received shortly before his cousin's passing. When Philip finally meets this newly widowed woman, he is so taken with her charm and her beauty that he beings to fall in love with her as his judgment becomes more and more clouded. "My Cousin Rachel" is written and directed by Roger Michell and is based on the novel of the same name by Daphne du Maurier. This material has been adapted twice before, the first time in 1952 in a feature film starring Olivia de Havilland and Richard Burton, and again in 1983 in a made-for-TV BBC serial starring Geraldine Chaplin. We hadn't seen either version, so this story is still fresh and new to us. This new adaptation stars Rachel Weisz as the titular Rachel, a charming and cunning beauty who has been recently widowed. Joining her is Sam Claflin, who plays Philip, a young Englishman who cherished his recently deceased cousin, who was like a father to him. Right before his cousin's death, Philip received a chilling letter from him claiming Rachel to be an evil woman who was slowly planning and plotting his demise. Bitterly angry, Philip plots revenge against her, but those plans go straight out the window when he actually meet her. He is instantly stricken by her beauty, allure, and poise. This person couldn't be the monster his cousin described. The two begin to grow closer, but all may not be as it seems as Rachel begins to slowly control and influence Philip without him even knowing it. Victorian era England is a favorite subject among filmmakers. The pomp, the faux pleasantries, and the prim and proper all give directors and designers a chance to show off classical looking settings and make intricate, gorgeous costumes to go along with epic camerawork and stunning cinematography. These kinds of pictures can be hit or miss for us. Sometimes we enjoy them quite a bit, as was the case with the movie "Far from the Madding Crowd," and other times, we don't enjoy them at all, for example, the terribly boring "Effie Grey." 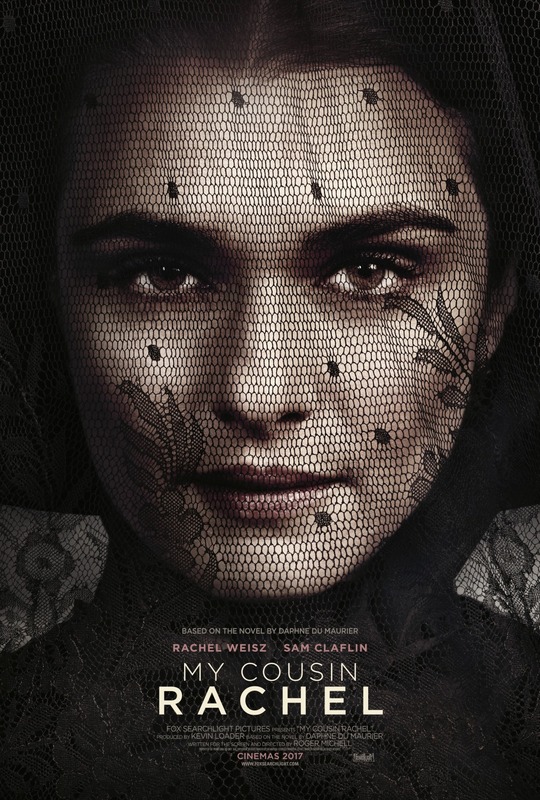 As for "My Cousin Rachel," we enjoyed it for the most part. We manage to get pulled in by the mystery of it all as Philip has to discover whether or not Rachel is actually a sinister woman with evil intentions, or if he is merely projecting. On one hand, we watch her manipulate Philip and make him bend to her will, but on the other hand, we always have to wonder if her actions are actually sincere and just appear manipulative because Philip is harboring such anger about his cousin. To top it all off, Philip isn't the brightest guy in the world and didn't take well to schooling. He is young, naive, and lets his emotions constantly cloud his mind and his judgment. Rachel never once asks Philip for anything, money or otherwise, thus giving her more charm than meets the eye. The best part about "My Cousin Rachel" is by far the acting. Rachel Weisz and Sam Claflin both put on superb performances, and the two play really well off of one another. Weisz is one of our favorite actresses. She is such a powerful performer. Here, she walks a fine line between sad widow and cunning temptress, blurring the lines between what's spoken and unspoken. She uses sexuality and her femininity as a tool to inadvertently get what she wants without having to beg for it. Claflin has really grown on us as an actor over the last few years. We really enjoy his performance as Philip, even though he is playing a little bit of a dullard with a temper and an agenda. He has a fantastic ability to fly off the handle at any given moment, but can also be soft spoken and innocent when he needs to be. He is also able to fully display the attributes of a man falling in love with the one person he shouldn't be loving. There is some excellent writing and dialogue throughout the film with a couple of hard hitting lines early on in the opening narration. There are a lot of twists and turns, lies and deceit, thrills and drama. We didn't expect it to end the way it did, and Michell keeps us guessing the whole way through its run time. Also, it is a nice change to see a movie about an older woman beguiling a younger man as it is almost always the other way around in cinema. The film's only real drawback is its pacing. It moves pretty slow throughout its run time as the layers are slowly peeled back inch by inch, but at least it isn't too excruciatingly long. Any longer and we would have given it a lower score for sure. "My Cousin Rachel" can be a taut thriller at times. It will keep the audience questioning the characters and their motives until the credits roll. This is a good watch for fans of period piece films set in the Victorian era in England, and fans of mystery movies will enjoy this one as well.